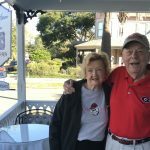 Can you say “Go Dogs?” Jim and Sue have been joining us for over five years now at the Blue Heron Inn for the annual GA-FL game held in nearby Jacksonville. They’ve been awesome guests but no one would ever guess the cool stats they possess. You see, this past game was the 58th consecutive GA-FL game the duo has attended together. Yes, that’s correct! This cute couple met in college at UGA, got married, started a family, worked their jobs, all the while never missing a game together! That’s consecutive games…and that’s pretty impressive! Loved seeing you again Jim and Sue! Posted in Amelia Island Bed and Breakfast, Amelia Island Florida, Florida, Florida Gators, football, Georgia Bulldogs | Comments Off on Beat this Record!